“Jr.” Jeremy Kane received his MFA from Ohio University in 2003; he was also the Taunt Fellow at the Archie Bray Foundation in 2004. In addition to touring with his bluegrass band, Clark County (named after his Ohio hometown), he has exhibited his functional and conceptual pottery nationally. He currently heads the Ceramics Department at the University of Alaska – Southeast, in Juneau. 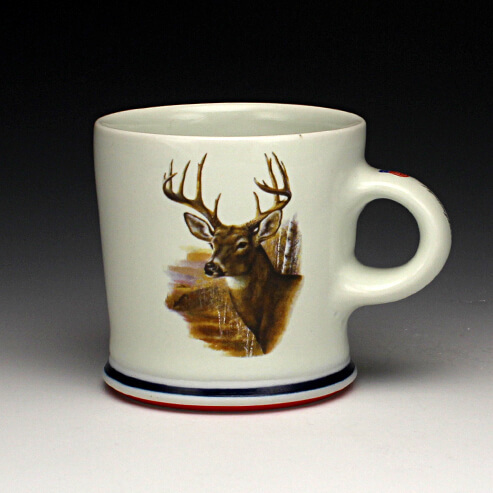 Jr. densely saturates his traditional porcelain functional wares with popular imagery rooted in blue collar Americana. His thrown bowls, jars, mustache cups, and jugs are covered with found decals like old cars with bumper stickers, combining glitzy and tacky for kicks and to jest at common perceptions of the relationship between art and kitsch. He is influenced by late night bar-room scenes with his band, the stoic trucker and his peepshow girlies, Elvis, God, Guns, Beer, and other classics like Cars and Beer. In particular this body of work depicts “Western” wildlife and other things Alaskan. He brazenly brands his pots with his name and iconic logos like “Harley Davidson” to exploit the issue of the artist’s ego and explore the distinction between commercialized commodity and the conceptual fine object.